If ideas are the currency of innovation, where can find (or steal) some more of this currency? Ideas are the currency of innovation. Artists (and creators of any sort) are in the business of taking ideas and mashing them together like a visual food processor to end up with something new, fresh, inspiring and… unexpected. I recently came across Austin Kleon’s New York Times best-selling book, Steal Like an Artist, and found it spiritually exfoliating (did I just combine those two words? Yes, I did… no denial. Yup, I said that.). Why did I find it so stimulating? Because we live in a world suffering from a bad case of mediocrity overload and I feel refreshed when I am exposed to those who find the status quo less than satisfying. First of all, it takes great genius to spot something that’s remarkable. Plus there’s this point: there’s nothing wrong with being inspired by things we see, hear and read. In fact, there’s something very wrong with not being inspired by the things one perceives in life. So, when I see an artist, inventor or creator in any field who’s done something worth noting, I applaud them. I respect those who do the mental magic that ends up challenging the norm. I recently found such an individual. I recently ran across some of his brilliant illustrations that challenge the 3-dimensional world we live in. I was so jazzed after seeing these that I sought him out to share his tremendous works with friends and subscribers and to ask him what inspires such a unique view of the world. Here are his answers. 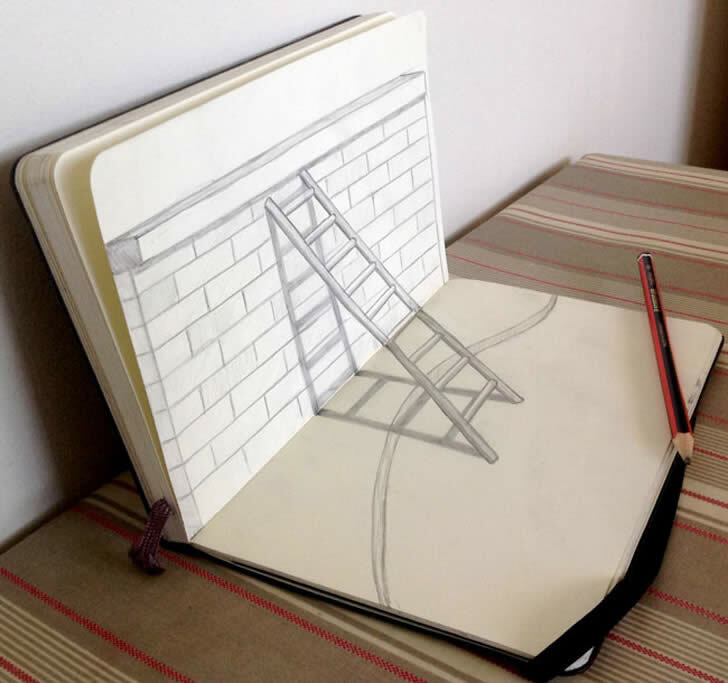 What inspired you to do these types of 3-dimensional drawings? How do you achieve the stretched angled perspective and plan it for looking “correct” when viewed from a specific angle? What’s your biggest challenge in drawing using this approach? What surprises do you run into when it’s all done, any aspects that surprise you in spite of the planning? This image above shows Darren’s art “flat” before it’s seen from the planned viewpoint (as shown below). I want to thank Darren for his inspired works and his permission to share these images with the world.